Did you enjoy your recent “Anthology” solo tour in the U.K? Yeah, I did enjoy it very much. We did 15 shows. It was very relaxed and we had a great time. You have released 16 solo albums. How difficult was to choose 33 songs for your double “Anthology” album? I think I was choosing from 12 studio albums, from “Beginnings” (1975) through “Time” (2011). I enjoyed the time I spent for the “Anthology”. It shows the different styles that I play, but with some continuity. So, we were just looking for the continuity, because each track from this or that album, it’s a very good track. I like each track we were compiling, but we were looking for the best mixture. Do you think your “Anthology” release is also a good chance for younger listeners to learn about your solo work? Well, I think it’s a pretty good example of that. You know, it’s a selection of songs. It’s a cross section of my albums. Yeah, very good. 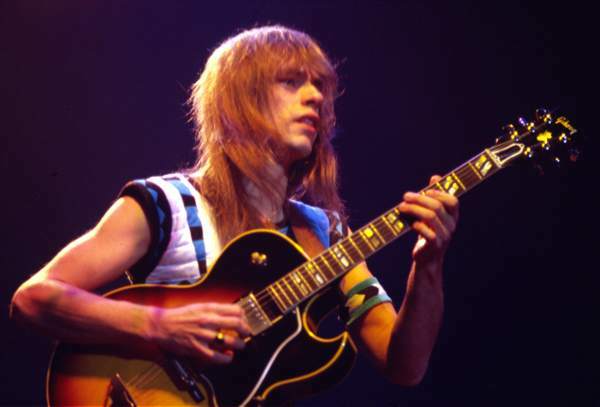 How spontaneous was the musical direction of “The Steve Howe Album” (1979)? There is a country/bluegrass feeling on it. I think about that nearly half of my albums are so demonstrative or just show the different things that I do. They have got a mixture of the different styles I have recorded and the people I had the chance to play with through the years. 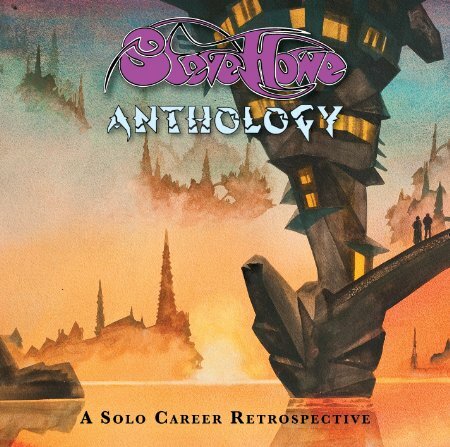 When I think about my second album, “The Steve Howe Album”, I see that it has a lot of country feeling. I followed a lot of country pickings, a country style on it. It was pretty mature for me. I love all the kinds of music and especially country. Chet Atkins is my favourite country music guitarist. Yeah, I managed to play that kind of music there. Was it a big challenge for you to have a 59 Piece Orchestra in the song “Double Rondo” from “The Steve Howe Album”, arranged and conducted by Andrew Jackman? Wow, it was really exciting!! I started working on it with Patrick Moraz (ed: Yes keyboardist on “Relayer”) and he got a nice orchestra and Andrew did arrange it for me. He had a really formidable patience. I dearly miss him. He did a great work and I am very thankful to him. But then, it’s my work. What are your plans for the near future? Yes have a summer tour with Toto. I have about three months between my solo tour in April and the Yes tour with Toto in August. Now, I am working on recordings and editing and more recordings. 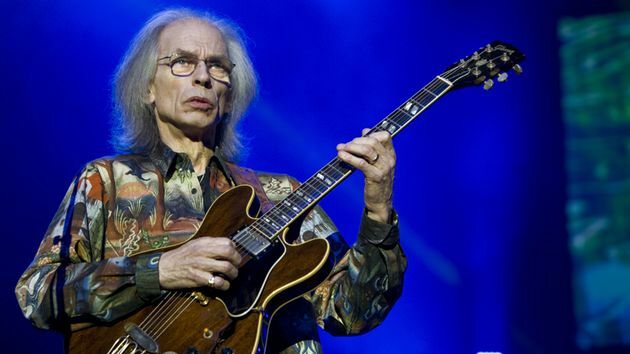 I am finishing a Steve Howe Trio album of new music. I’m so busy!! I think I’m busy enough. Was it an interesting experience to work on the latest Yes album, “Heaven & Earth” (2014), with Roy Thomas Baker (Queen producer)? It was a combined effort between the group, Roy and Billy Sherwood (ed: former member of Yes) who mixed the album in the end. Basically, it was a very intense experiment. With Roy, we had worked so long ago (ed: in 1979, after “Tomato”). It was a mixture of hi-tech and low-tech: With instruments having all the Pro-Tools and that kind of stuff in the studio, and sometimes we wanted things to be a little bit downward. I don’t know if the process achieved it or if it was something that we should have done. Basically, it’s a record somewhere between those two things: like the old music but with quite a new spirit. This albums contains different feelings, different characters. Well, it’s ok.
Are you proud of “The Yes Album” (1971) and its influence on great musicians like Geddy Lee of Rush and Joe Bonamassa? Yeah. Well, I mean people have drawn a trajectory of what happened and where we were at a certain time. They go back to the ‘70s, to the roots of real progressive (ed: music) and the release of the multiple albums, the double albums, which was a big time. And then in the ‘80s, they hear a new band really, for a couple of albums. And then we got back together, after the three albums that I was off (ed: “Drama”, “90125” and “Big Generator”). And then they go to 1995, when we did “Keys to Ascension”, which has some great studio tracks and brought new life to the band and new people came in and bought our records. You mentioned “The Yes Album”. I love that record. It’s the start of a long period and people seem to like it. They hear good music in different ways. Music that set a new musical direction. I still love this music. It’s experimental music. You had a problem with your Gibson ES-175 on an Air Canada flight in London. Can you tell us that story? I haven’t thought about this story for many years. I took my guitar for many years in flights and nobody really questioned for it. And then they became picky about guitars, especially big guitars and it got me in trouble. So, I started buying tickets for it and usually I had a seat next to me for my guitar. But this time, they couldn’t give a boarding pass to my guitar. They said: “You can’t have a seat without a person in it. We can’t give it a boarding pass”. It was a funny thing. They said: “It can’t have a boarding pass, so there is one seat available”. I said: “It’s not available. I paid for it” (laughs). It was a crazy situation. I have travelled with my guitar all over the world. Some airlines can cause me problems. Could you imagine Yes without the great album covers by Roger Dean? Not really, at all. 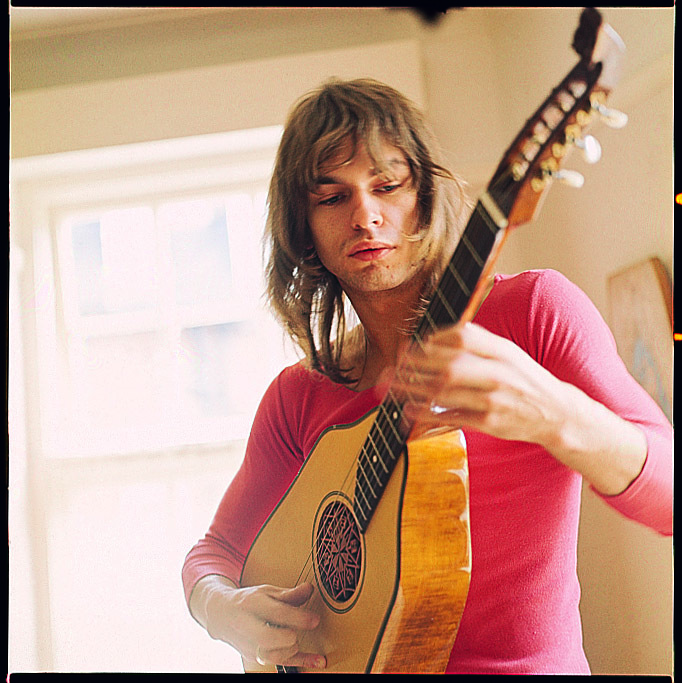 I find that Roger is synonymous with the Yes recordings. Yeah, I love his drawings and the album covers he did for Yes and Asia. I got to know him as a person, as well. I recently (ed: on 12th April) performed at his exhibition at Trading Boundaries. With Asia we had his visual images in our stage show, as well. He did a great drawing for the album cover of “Heaven & Earth”. He also did the album cover for my “Anthology” solo album. Yeah, I mean Roger is great! One of the things I like most about “Heaven & Earth” is his really, really beautiful drawing. The group had recorded the album, we had many ideas, inventive ideas and somehow Roger and I, were talking on the phone and I told him some song titles that had the words “Heaven” and “Earth”, but they were in different titles. So, he said: “Why don’t you combine this word with that?” I said: “Yeah” and we did it. As far as his painting, some people questioned, but I never question. He can put in some very inventive ideas. He also did the artwork in some of my solo albums. 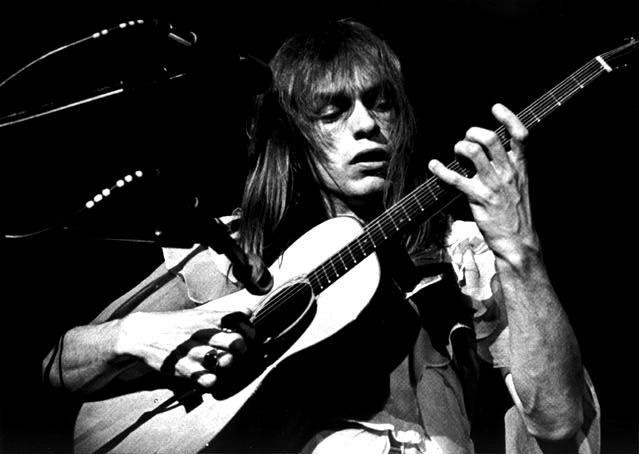 What’s your opinion about the Yes cover to Paul Simon’s “America”? I think it’s one of the best covers ever recorded. I had the chance to meet him in 1993 and I asked him point blank what he thought about it and he said that it was great. And he also liked the part with the guitar solo, the circular sound of the solo. Paul said that and I was excited. Basically, that collaboration was something good that pick out that song and maybe half a dozen other songs among the most favourite of the fans during lives. The high level of inventiveness is that Bill (ed: Bruford –drums) played Mellotron in the end of the song. We play other songs and then we play “America” and it’s wonderful. It’s a very effective and exciting re-arrangement. It amazes me. Why Vangelis didn’t join Yes when Rick Wakeman left after the “Tales from Topographic Oceans” tour? I am gonna be very honest about it. What happened was that of course we had some relationship with Vangelis, and Jon (ed: Anderson ) and Vangelis knew each other quite well. So, when Rick left, Jon said that Vangelis would be an amazing choice and we thought if this could work and how the things could work out. So, we did rehearse in the country. We all were there and Vangelis showed up. He set up his keyboards and I think we were together for a week. I can’t remember how much time I thought has passed. I can’t think that it was one week. I still have the feeling that it was two weeks. We were feeling impressed and he’s an amazing musician, with his physical power and his ability to demonstrate what he is after. But also the real issue that made it not to work -although we worked really hard with Vangelis and Vangelis showed an incredible power- Vangelis couldn’t work with song structures. Every song has its structure. When you think of the Yes music, you think about our songs which are very highly arranged. He didn’t want to follow the structure. In other words, he could play one thing, one day and the other day he could play something different. We couldn’t do that. We have to know (ed: what the other band members are playing). Although, it’s been a long time ago, I believe that Vangelis didn’t want to tour. He preferred being in the studio, in a controlled environment where he could improvise. We wanted to follow the arrangement because you had to play that thing, at that time, with that way, with that sound, with that harmony, at that time. When we were ready to play our music and songs like “Heart of the Sunrise” he said: “Oh, fine” and he would play (ed: he imitates sounds) “doggy-doggy-doggy” . We had a fascinating time, I love his music, I love his style and I love him as a fellow musician. I really cherish that time but unfortunately we got stuck with him. Do you believe that a good guitarist can play any kind of music? But you can play any kind of music! I approach now. Because I heard Chet Atkins and I like his style very much. I can play any kind of music or I hope so, because I learned that kind of music by hearing all the country guitarists many years ago. I can play any kind of music because I was fascinated with these sounds. It depends if I enjoy that kind of music and I want to do that. If I enjoy something that I hear, I’ll have a go on it. I listen to country and classical music and I let these things flow in the music that I play in a band and solo. I am very happy about that. I listen to country music and I have a go on it. It’s not required. There are some great guitarists. I like to be influenced by other people. I like to hear good music. Music that means something. When I played with Martin Taylor I used to think: “What a terrifyingly great guitarist he is? !” He’s so good at many certain things that I am not. I like that. People ask how I do that and they don’t ask: “How they do that?” I listen to other people’s albums and collaborations. Were you frustrated when some journalists harshly criticized the music of Yes? I can’t say “no”. Yes. I don’t think they were right. This happened mostly in England. It’s very different in America. In America we had far less criticism, if any. We escaped criticism by staying for long periods of time in the States. Not only with Yes, but also with Asia, GTR and ABWH (Anderson Bruford Wakeman Howe). Yes, I’m very pleased. I never stopped buying and listening to vinyl records. Me and my family, we have more than 10.000 records. Yeah, I have a very good collection. I cherish them. You don’t cherish a download (laughs). You have to look after a vinyl record. This doesn’t happen in digital. You have to turn the sides on the turntable. It needs patience. You could have big problems with defective records. You have a feeling that you can’t live without it. I know some people who don’t like the digital sound. They prefer the sound of a vinyl, like the way I do. We enjoy the sound, we enjoy the album cover, we enjoy that. With a vinyl record, you can immerse with the music itself. How did it happen to play the flamenco guitar part on Queen’s song, “Innuendo” (1991)? It happened by chance. I was in Switzerland, I stopped to have lunch and I met Martin Groves, who was Queen’s equipment supervisor and he told me to come to the studio. They played me the whole album. Last they played “Innuendo” and I thought it was an amazing, amazing song. And they asked me if I would like to play. So, I played a little bit. I didn’t play too much. So, I improvised, I played a few lines on the top of the whole thing. So, that’s it. It was nice. I had it a go. It’s not really long, but it’s a nice thing. It was nice that I was able to play with Queen and especially with Freddie, which was his last record. Do you have happy memories of the shows that Tomorrow played at the legendary UFO Club? Oh, yeah!! I mean, crazy, crazy days! Very formative and a little out of control. As human beings, everybody was a little out of control (laughs). But we had a great time. It was a time when you looked around, you could feel the emotion and have fun. We didn’t stay together for too long. It was a time when I tried to find out what to do and different ways to play. We played night after night. Everybody was dancing (laughs). We had a great time. It was very exciting. You could listen to other groups, like The Beatles, you could do vocal harmonies and get good ideas. If you remember, Jimi Hendrix joined you on stage at the UFO Club. Yeah, I do. Jimi got up and picked up Junior’s bass (ed: John “Junior” Wood –Tomorrow bassist) and he started playing with that. It was amazing. We didn’t play together for too long, but we had a great time. Is there any question that you would like to answer, but nobody asked you? (Laughs) Just let me think about it. I guess, not really. Because I ‘ve done too many interviews in my life and I think some of them are quite good. But in another life, it would be nice if the interviewer really listens to the music, to what comes from it. That will be a development. Interviews are part of my work. I’ve done them for too long. Eventually, I don’t like to answer to any questions (laughs). People ask the same questions, basically. I think you can’t talk about music per se. Music per se, means music alone. You can talk about things about music. But talking about the music itself, it’s quite difficult. So, maybe we shouldn’t talk about music or maybe we should find a better language to describe THE music. We can talk about compositions, we can talk about musicians, we can talk about performances, we can talk about different things. Which all are associated with the music, but it’s not actually about the music itself. I think that we had a good conversation today. A huge “THANK YOU” to Mr Steve Howe for his time and to Ben Conway for his valuable help.